Kanye West was pictured in Paris earlier today on 23 May 2014. The American artiste is in town for the imminent wedding to Kim Kardashian, rumoured to be on Saturday 24 May 2014. 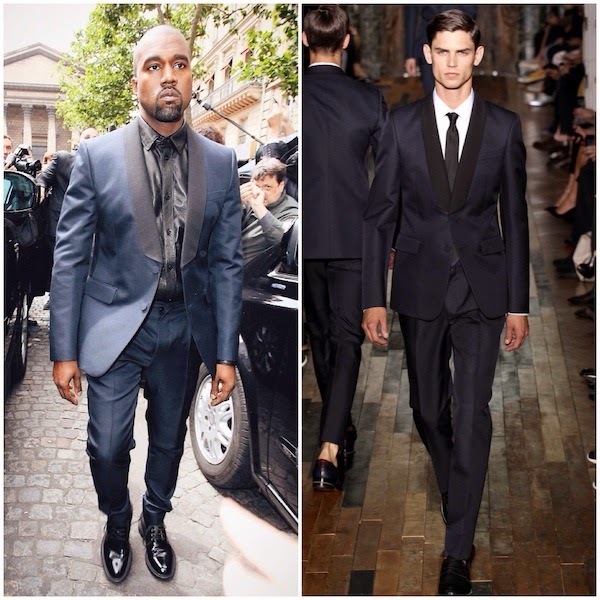 Kanye West was pictured outside his hotel in a blue contrast lapel tuxedo from Valentino Spring Summer 2014, which he wore over a black leather shirt and polished black leather lace-ups. I really like this look. I thought the tuxedo fitted him very well, and I love the pairing with the unexpected leather shirt. A nice contrast between tough leather shirt and the nice romantic vibe from the blue tux. His shoes were pretty ace too, all in all a good look. Although I've never seen anyone gloomier the day before their wedding. As the jacket is open, i don't really like the idea of a leather shirt with it. But, i really like those Saint Laurent boots. The shirt is not Valentino.